Why Setu project? Meenam Fisheries Ltd. – an intl. Private company -- with shipping vessels and marine export interests. Meenam Fisheries Ltd. owns a shipping vessel as seen below. One mariner claims he was for five years a mechanic Deck Hand (25 mts vessel) in Meenam Fisheries Ltd. This establishes the fact that the Intl. Private Company, Meenam Fisheries Ltd. is also a ship-owner. About us: Meenam Fisheries is a market leader in India with fishing oprerations in more than four countries and exports to all over the world.We export deep sea lobsters , shrimps etc which are processed in a state of the art processing unit meeting the highest possible standards in the fishing industry. In his affidavit, Mr. Baalu declared that he had assets worth Rs 2.25 crores, including a house in Kodambakkam valued at Rs 1.25 crores, Rs.3.5 lakhs in cash and Rs. 55,000 as deposits in two banks. He also held shares of Rs 47.5 lakhs in King India Chemicals Corporation Limited, Meenam Fisheries Limited and Kings India Power Corporation Limited. He owned a car — a 1993 Premier, valued at Rs 30,000. Mr. Baalu also declared ownership of agricultural land valued at Rs. 35 lakhs in Pudukottai and Thanjavur districts. He owned industrial land in Kancheepuram district worth Rs. 10 lakhs. Mr. Baalu's family members had assets worth Rs. 50 lakhs. *** Managing Director: Kings India Chemical Corporation Limited (Listed Company in the field of Manufacturing and marketing of Chemicals. The following is the list of products available at our end. You may go through the same and revert to us with any specific species that you may need. Please specify your required mode of packing, your choice of frozen, fresh(chilled) or live, tentative quantity and grade(count per kilogram/lbs) . *Spiny or Rock Lobster(Panulirus Homarus) ---live or frozen. *Spiny or Rock Lobster(Panulirus spp) ---live or frozen. *Deep sea lobster tails(Puuerulus spp) --- frozen. *Giant Tiger Prawns(Penaeus Monodon) ---frozen or chilled. *White Prawn Indian (P. Indicus) ---frozen or chilled. *Deep sea shrimp(Solenoccera sp) ---frozen or chilled. *Kuruma Shrimp(P. Japonicus) ---frozen or chilled. *Silver Pomfrets(Pampus Argentus) ---frozen or chilled. *Black Pomfrets(Formio Niger) ---frozen or chilled. *Pearl Oyster (Pinctada spp) ---Hand Picked. *Cuttle fish(Sepia Spp) ---dried or frozen. *Squid (Loligo duvaucelii) ---dried or frozen. *Green mussel (Perna viridis) ---hand picked. *Hammer Head Shark(Sphyrna Zygaena) ---frozen or chilled. *Milk Shark (Scoliodon Walbeehmi) ---frozen or chilled. *Bramble Shark(Echinorhinus brucus) ---frozen or chilled. *Red Snapper Malabar (Lutjanus malabaricus) ---frozen or chilled. *Seer Fish(Scomder Omorus Commerfon) ---frozen or chilled. *Kalava(Epinephelus Sp) ---frozen or chilled. *Mackeral(Rasprelliger Kanagurta) ---frozen or chilled. *Crabs(Kani) (Portunus Sanguinolentus) ---Meat, whole or live. Hope you are satisfied with our description of available products. Please feel free to place requests for specific species which may not be listed above. Meenam Fisheries is a market leader in India with fishing oprerations in more than four countries and exports to all over the world.We export deep sea lobsters , shrimps etc which are processed in a state of the art processing unit meeting the highest possible standards in the fishing industry. Product/Services: We are exporters of Frozen Sea Food products eg: Lobsters, Shrimps, Fish etc. Union Shipping and Surface Transport Minister TR Baalu, who is also a confidant of DMK chief M Karunanidhi, is no stranger to controversies that raise serious doubts about his integrity quotient. In the past he has shown remarkable interest in pushing the disastrous Sethusamudram Ship Channel Project in defiance of popular outrage. Mr Baalu's critics insist that creating a shorter route for merchant ships is the last thing on his mind; he is more worried about idling dredgers and stalled work farmed out to contractors. The Minister's strenuous efforts, at times sly and slimy, to bulldoze the Government into going ahead with the Sethusamudram project irrespective of court injunctions, do generate a sense of unease about his true intentions. That Mr Baalu does not have a high integrity quotient is now demonstrated by his misuse of office to benefit two firms in which his wives and sons have more than a passing interest. It transpires that he 'requested' -- an euphemism for arm-twisting or political blackmail, call it what you will -- ONGC and GAIL to divert Cauvery Basin gas to these firms at a time when there was a mismatch between demand and supply. The Petroleum Ministry is with the Congress and it does not require extraordinary intelligence to figure out why a 'request' by the resident strongman of the DMK in Delhi, whose proximity to the party boss in Chennai is no secret, was more than honoured, with officials scampering to do Mr Baalu's bidding. Such is this man's inability to distinguish between that which is patently wrong and morally right, that he had no qualms about standing up in the Rajya Sabha, where the issue has been raised for two consecutive days, and asserting, "What is wrong in it?" Only those who are entirely bereft of probity and believe that misusing authority is part of the privilege of holding public office can be so scandalously callous. It would, however, be unfair to place the entire blame at Mr Baalu's door. Politicians like him cannot be expected to act honourably when in office. But what is distressing is that a man who makes a fetish of honesty and integrity presides over a Cabinet many of whose members are perceived to be lacking in both. Prime Minister Manmohan Singh cannot pretend ignorance of Mr Baalu's dubious activities, nor can he take shelter behind the argument that it is ultimately the DMK's choice as to whom it wants as a Minister. Mr Baalu has claimed that he kept the Prime Minister informed about his 'request'. If this is true, then the Prime Minister owes an explanation as to why he did not reject the 'request' in keeping with his squeaky clean image that his publicists tirelessly project to prove he is a good man undeserving of uncharitable comments. Mr Baalu cannot get away with his obnoxious disregard for ministerial probity; the scandal should be investigated by the CBI and the full truth unearthed; till the inquiry is over, he should be made to sit out. At the same time, neither should the Prime Minister be allowed to get away by maintaining stony silence. He must explain to Parliament, and thus to the nation, as to why the 'request' of a Minister with a dubious record was entertained. Stonewalling the issue won't do. New Delhi, April 24: The issue of Shipping Minister T R Baalu allegedly asking GAIL to provide gas to companies with which his family was associated today snowballed, leading to adjournment of the Rajya Sabha for the day, while AIADMK supremo J Jayalalithaa demanded the resignation of Prime Minister Manmohan Singh for ''aiding and abetting'' him. During the Question Hour in the Upper House of Parliament, AIADMK member V Maitreyan was asked by Chairman Hamid Ansari to leave the House after the AIADMK member repeatedly disrupted the proceedings on the issue. The Rajya Sabha plunged into pandemonium today for nearly 90 minutes in the post-lunch session after which it was adjourned for the day with the opposition BJP and SP members vociferously demanding revocation of the eviction of the member. The Chairman of the Rajya Sabha said,''I have witnessed a situation I have never witnessed before. A senior member of the House is deliberately violating procedures. Under the relevant Rules of the House, the Chair may direct any member who in his opinion is violating. I am invoking this rule against the member.'' Thereafter, the AIADMK member left the House which then carried on with its normal business. Yesterday too, the AIADMK member had raised the issue in the House. Dr Maitreyan alleged that the minister had 'armtwisted' the ONGC and GAIL for favouring the companies 'Kings India Chemicals' and 'King Chemicals and Kings High Power' with which his family was linked. He claimed that 'Kings India' was on the 2004 list o Tamil Nadu bank defaulters and urged the Prime Minister to come clean on the matter. Mr Baalu then said he was the managing director of the two companies before becoming a minister. The companies, he said, were referred to BIFR and its employees and shareholders were in trouble. ''In 1999, Kings High Power had entered into an agreement with GAIL for the supply of 10,000 cubic metres of gas to it. But the gas company went back on its word as part of revenge taken by the NDA government and the BJP as I quit the alliance in 2003,'' Mr Baalu said. ''The employees and shareholders approached me with the problem. I then put in a word with the petroleum minister for supplying gas to the ailing company. I was trying to save the company. What is wrong in it,'' he asked. Meanwhile, in a statement in Chennai today, Ms Jayalalithaa sought Mr Baalu's sacking and demanded the resignation of Dr Singh for ''aiding and abetting'' him in ''arm-twisting'' the Petroleum and Natural Gas Ministry. She alleged that never before had such a grave charge been levelled against a Prime Minister who had not reacted to the reports in this regard in a section of the media. Quoting reports, she said Mr Baalu had arm-twisted the Petroleum and Natural Gas Ministry over the past two years to provide gas from the Cauvery basin to two companies, Kings India Power Corporation and Kings India Chemical Corporation, owned by his two sons T R B Rajkumar and T R B Selvakumar. ''Interestingly, Mr Baalu's two wives, Ms Porkodi and Ms Renuka Devi, hold huge stakes in these companies'', she also alleged. Ms Jayalalithaa said this was a grave charge of misuse of office, nepotism and corruption relating to Mr Baalu's tenure as Union Minister of state for Petroleum and Natural Gas during 1996-98. ''Not only is there a documented charge that the Union Minister was indulging in nepotism and corruption, there is also a charge with proof that has not been refuted that the Prime Minister is actively aiding and abetting this crime'', she alleged. Dr Singh was according ''unequal treatment'' by bending rules to favour a Cabinet Minister merely because that Minister's party was necessary for his government to continue in power, she alleged. The demand for sacking of Road and Shipping Minister TR Baalu, in the dock for arm-twisting GAIL and ONGC to allot gas to companies owned by his two sons, gathered momentum on Thursday and dominated the proceedings of the Rajya Sabha for better part of the day. For the second day in row, AIADMK leader V Maitreyan stole the show in the Rajya Sabha by demanding Baalu's removal from the Union Cabinet and a statement from the Prime Minister on the scandal. The RS Chairman's decision to expel Maitreyan from the House for persisting with his demands, acted like fuel to the fire and united the opposition. With the BJP, Samajwadi Party and the TDP throwing their weight behind Maitreyan, the Government may find it tough to protect Baalu, who himself admitted on Wednesday to seeking gas for the family-run business. But surprisingly, despite such serious charges, there is no official reaction from the Government. While this could be open to interpretation, but it is well-known that even a section of the Congress is unhappy with Baalu and would like to see him go. The Rajya Sabha witnessed uproarious scenes and then adjournment as the Opposition objected to Maitreyan being asked to leave the House by Chairman Hamid Ansari. The Chairman invoked the rarely used rule 255 when he asked Maitreyan to "withdraw' from the House for persistent defiance of the Chair. Stating that "it was disorderly conduct unbecoming of a member", Ansari said the member was "deliberately violating the procedures of the House." Prime Minister Manmohan Singh was present in the House when Maitreyan raised the issue as soon as the question hour commenced and said the Prime Minister should reply on the irregularity committed by his Minister. Ansari reminded Maitreyan that he had been allowed to raise the issue and had got a reply from the Minister on Wednesday but the AIADMK leader and his party colleagues were in no mood to oblige the Chair. Unable to calm down Maitreyan, the Chairman asked for the Rule Book and announced: "I am invoking Rule 255 of the Rajya Sabha rules and asking the member to withdraw from the Council of States." Maitreyan left instantly. According to Rajya Sabha officials, Rule 255 states that the concerned member has to withdraw from the House the moment the Chair invokes the rule. The member has to stay away from the proceedings of the House for that day. The last time the rule was used in 1989. As soon as the House re-assembled for the post-lunch sitting, the BJP and the UNPA members were on their feet protesting against Ansari's ruling and insisted that the issue be resolved before any other business was taken up. PJ Kurien, who was in the chair, however, said the ruling of the chair could not be challenged. BJP members led by Sushma Swaraj and SS Ahluwalia said they were not questioning the ruling but they were raising the "question of rights of members". new." Samajwadi Party MP Amar Singh said he was "not questioning the ruling, or the procedure or the system. What I want to know is why rules are used selectively against party members other than the Congress and the BJP." The chair then asked the Parliamentary Affairs Minister to explain the ruling party's stand, but by now the Opposition members were in no mood to listen to him. They began shouting slogans, "Raksha karo, raksha karo, hamare adhikaron ki raksha karo (Protect our rights)". At this, ruling party members V Narayan Swamy and Jayanti Natrajan protested saying how can they question the ruling of the chair in the House. Sushma Swaraj suggested to the chair that the House be adjourned and the matter be resolved in the Business Advisory Committee. Kurien, however, refused saying "I am in the chair. How can I adjourn the House on the question of chairman's ruling." Sushma said "I am only saying that this issue cannot be resolved in this heated atmosphere." She then recalled how in this session itself a similar situation had arisen when names of 11 SP members were notified and the SP members did not allow the House to proceed. The matter was finally settled with discussion by party leaders in the deputy chairman Rehman Khan's chamber. CPM MP Brinda Karat also said that she was also present when the incident happened as her party had supported the SP members then. Finding the issue not getting resolved, Kurien in chair adjourned the House for the day. Corruption is ‘King’ Baalu’s virtue! INDIANS, LOOKING desperately for any iota of evidence about a possible reversal of the downslide that public ethics has suffered in recent decades, eagerly lapped up what Prime Minister, Manmohan Singh, and Chief Justice of India, KG Balakrishnan, had to say last week from the same dais. The stink, raised by a debate in Parliament this week, about clandestine deals of two Tamilnadu-based companies, has however proved that all such talks about combating corruption are no more than lots of gas, literally so! In the eye of storm is an honourable member of the August Parliament since over two decades – Thalikottai Rajuthevar Baalu. He has the distinction of being voted by readers of a popular Tamilnadu newspaper as the worst performing TN representative in New Delhi. But, it must be said to his credit that he is perhaps the only TN politician who has stuck from the time he entered politics to a single party. He has been a loyal Dravida Munnetra Kazhagam (DMK) man for 50 years, while everyone else in TN – his boss Karunanidhi, MG Ramachandran of ADMK, Jayalalithaa, Ramadoss (PMK), Vaiko (MDMK) etc – are all defectors and had splintered from their original abode. Currently, Baalu is the cabinet minister for shipping, road transport and highways, arguably the most incompetent in Singh’s team. He has been flayed for the shabby progress made in the government’s plans to improve transport infrastructure. National Highways Authority of India has been lagging behind all targets due to corruption and inefficiency. But, he has survived all charges due to his gift of shrewd manipulation and dogged loyalty to his ‘thalaivar’ (leader). He has ‘served’ earlier as union minister of state for petroleum, natural gas (PNG) and non-conventional energy sources and was cabinet minister for environment and forests from 1999 to 2003, during the NDA regime. TRB Porkodi and B Renukadevi, the two wives in the minister’s household, are major shareholders in companies founded by the loyal servant of the people of TN and India. These companies are ironically named ’Kings India Power Corporation’ and ’Kings India Chemical Corporation’! Kings Chemical chairman, TRB Rajkumar, is his son and holds the bulk of responsibilities of the companies. The benevolent ‘King’ that Baalu is, he is apparently quite concerned about the welfare of all stakeholders in these outfits, including his kin! It was no surprise that gas from Kuttalam and Narimanam zones of the Cauvery basin was officially awarded to the two companies of the one-time PNG minister in late 1990s. Kings High Power had entered into an agreement with Gas Authority of India Ltd (GAIL) for the supply of 10,000 cubic metre of gas. The allocation got lapsed after obtaining repeated extensions. Baalu had been made a minister in the NDA government, of which DMK had become a constituent, when the Congress government at New Delhi had pulled down the state government headed by the party. When DMK made peace with the Congress and pulled out of the NDA government in 2003, he was instructed by Karunanidhi to step down. Baalu got into the act when the UPA came to power and he could get a ‘lucrative’ position, although not the original PNG estate! In June 2006, a meeting was held with Baalu and the PNG minister where “it was considered that ONGC will look into…additional availability of gas.” Dr UD Choubey, GAIL’s CMD, referred to this meeting in March 2007 in a letter to RS Sharma, the CMD of Oil and Natural Gas Corporation (ONGC) after he summoned them once again. This conclusively proved the surface transport minister got the PNG companies to supply gas to his family’s companies. When they meekly complied, the Tamilnadu Power Producers Association went to court, both in Delhi and Madras, against the allocation. Both courts stayed the allocation. The indefatigable TN politician Subramanian Swamy raked up the entire muck in a petition to Prime Minister, Singh, in February 2008. Apart from the obvious abuse of his position to get his family companies favoured, Swamy accused, the company was a proclaimed defaulter, according to the 2004 list of TN bank defaulters. Kings Chemicals defaulted on a Rs 4.35 crore loan from IDBI, and a Rs 1.93 crore loan from IFCI. The law bars such defaulting companies from seeking the kind of consideration Baalu got them from the government. The shrewd minister had dodged the media and refrained from commenting the petition demanding that the PM come clean on the matter. “Since Swamy has made the allegations to the PM, it is for the PM to reply,” Baalu had quipped arrogantly. He had apparently figured that Singh would prefer to keep quiet, rather than getting muddied by the corrupt minister. He did not find any difficulty to thwart a Parliamentary discussion on the plea that the matter was pending in court. On April 22 (Wednesday), PJ Kurien, a Congress MP who was in the chair in Rajya Sabha, surprisingly allowed an ADMK member Maitreyan to draw attention to media reports on the scandal. Caught by surprise, Baalu opened a can of worms and virtually confessed. He unabashedly claimed that there was nothing wrong if he had “requested the Union petroleum minister” to provide gas to a company. He wondered what the big problem was if he was the managing director in the past and if his sons and their wives were currently associated. He had earlier confirmed that he was the managing director of the two companies before becoming a minister. What is wrong with this benevolent attitude except that it proves India to be failed state where crooks can get away with anything and still be ‘honourable’? As it happens in India, Kurien decided that the minister should not be inconvenienced further. He disallowed the demand from the opposition to take the matter further! The uproar over Shipping and Surface Transport Minister T.R. Baalu's moves to expedite gas allocation to companies owned by his sons continued in both houses of parliament Friday. In the Rajya Sabha, the Bharatiya Janata Party (BJP) forced an adjournment while in the Lok Sabha MPs demanded an inquiry into allegations that Baalu had misused his ministerial position to favour his sons' companies. Raising the issue in the Lok Sabha, V.K. Malhotra, deputy leader of the BJP in the house, said the government must conduct an investigation. Baalu admitted in parliament two days ago that he had put in a word to the petroleum minister and also pushed the Prime Minister's Office to expedite gas allocation to Kings Chemical and Kings High Power - companies owned by his two sons. NEW DELHI: It's not just Union surface transport and shipping minister T R Baalu who is facing the Opposition's ire over allegedly misusing his position to lobby with the petroleum ministry for gas allocations for King India Power Ltd, a company owned by his family. Now the Prime Minister's Office, too, has been dragged into the controversy, as the PMO has written not one or two but a string of eight letters reminding the petroleum ministry to expedite the issue of clearances for this company. According to a letter from the PMO, a copy of which is available with Times Now , S Baalu, director, Kings India Power Corporation Ltd, had represented to the PMO on November 5, 2007. The PMO letter dated February 4 traces eight reminders to the petroleum ministry between November 13 and February 4. What has raised eyebrows is the fact that the company needs a minuscule allocation of gas — to the tune of 0.01 MMSCD (million standard cubic metres per day) — which normally would not be an issue for PMO to get so involved in as to push it so actively. But this is no ordinary company; it belongs to the family of T R Baalu, surface transport and shipping minister, whose party, the DMK, is crucial ally of the UPA government. In fact Times Now had first reported in March last year that T R Baalu had held a joint meeting with petroleum minister Murli Deora on June 28, 2006, along with officials from GAIL, ONGC and the Petroleum Ministry. This was rather unusual as it was not an inter-ministerial issue but just a matter of gas allocation to a firm owned by Baalu's family. On Wednesday, Baalu admitted in the Rajya Sabha that he had "put in a word with the petroleum minister". But it appears that Baalu did not stop here. On March 1, 2007, he summoned GAIL chairman U D Choubey on the same issue, a fact recorded by Choubey in a letter dated March 2, 2007, to his colleague, ONGC chairman R S Sharma. 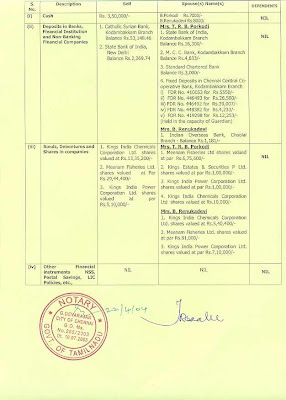 In fact, Baalu's affidavits on the Election Commission website show that he himself owns shares in the King group of companies. King Chemicals was given gas allocations in 1999 but despite several extensions was unable to sign contracts with GAIL owing to differences in the calculations of costs. According to file notings available with Times Now , on December 6, 2003, the company even informed the ministry of petroleum that "pending finalisation of transmission charges, we are not in a position to proceed towards signing of gas supply agreement with GAIL". Commenting on the PMO's intervention on the issue, senior BJP leader Arun Jaitley said: "The credibility of the PMO is under question when it involves itself in matters of gas allocations to private firms belonging to families of cabinet ministers." Prolonged noisy protests by the opposition led to the adjournment of Rajya Sabha for the day on Thursday. The opposition members were protesting against chairman Hamid Ansari's decision asking AIADMK member V Maitreyan to leave the House in the pre-noon session for disrupting proceedings over shipping minister T R Baalu's admission that he had requested petroleum minister to get gas for a company with which his sons and their wives are now associated. The natural gas that Union Minister and DMK leader T R Baalu has been pulling strings for is for King Power Corporation, a power plant that does not exist, and King Chemicals, a petrochemical plant that has been declared sick under BIFR. King Power is run by his son Selva Kumar and King Chemicals by another son Raj Kumar. Sources said that Baalu has been pushing - a fact he himself admitted in Parliament yesterday - ONGC and GAIL for gas for his sons' firms ever since it became a prized commodity. Reason: he wants gas at the administered price of $1.96 per million British thermal units (mBtu) when it's being sold anywhere between $6-$16 per mBtu. Selva Kumar has been writing to the Ministry and the Prime Minister's Office that the Ministry "restore" the allocated 10,000 standard cubic metres of gas per day (SCMD) for King Chemicals and allocate 0.5 million standard cubic metres per day (MSCMD) for King Power. Baalu, Union Shipping, Road Transport and Highways Minister, visited Petroleum & Natural Gas Minister Murli Deora's office on June 28, 2006 where chairmen of ONGC and GAIL were summoned to work a way out, as per official records. He later called them individually to his office, admonishing them for the delay. He also got the Prime Minister's Office to seek a status report on the gas allocation on February 4 this year. The genesis of the controversy has its roots in the NDA government in which the DMK was a crucial ally. After meeting the then Petroleum Minister Ram Naik, Baalu got 10,000 SCMD gas allocated for King Chemicals and 0.5 MSCMD for King Power in 1999. A gas supply agreement (GSA) was signed only for King Chemicals but the company delayed signing the transportation contract for it. After repeated extensions of the signing date, the GSA lapsed. The issue of re-instating the gas linkage was taken to the Madras High Court where a single-judge bench ruled in Baalu's favour. However, fearing a cut in their existing gas supply to provide for Baalu's company, APM gas consumers in the unit's vicinity approached the division bench of High Court which said that the issue be resolved by the Petroleum Ministry. Baalu then started working on Deora and Secretary MS Srinivasan saying that the withdrawal in 2004 was part of a political revenge by the BJP-ruled NDA government as his DMK party quit the alliance in December 2003. "Papers show otherwise," said sources, "and it is very difficult for us to restore gas supply to a defaulter." They said Srinivasan recently called for a meeting to work a way out but officials said the option was either to introduce a pro-rata cut on existing consumers in that area to provide for King Power or shift the proposed power plant to an area that could be provided the market priced gas. While the Ministry is opposed to the first option, King Power has said it will get back to the ministry on the second. In Parliament yesterday, Baalu put up a brave face: "These shareholders (of King Chemicals) asked me to do something about them. A BIFR company has to be saved by the management. Accordingly, I put a word to my friend, the Petroleum Minister. What is wrong with that?" With the Prime Minister’s Office getting dragged into the controversy over Shipping Minister TR Baalu’s alleged misuse of his position, the Opposition on Friday stepped up its pressure on the Government demanding the minister’s resignation and a statement from Prime Minister Manmohan Singh. BJP and AIADMK members disrupted the proceedings and forced three adjournments. The House could not carry out any business after the Question Hour. The Opposition members waved copies of, what they claimed were, letters written by the PMO to the Petroleum Minister in support of Baalu’s request for gas supplies to two companies with which he was associated in the past and in which his sons continue to have a major interest now. Demanding that the PM clear his position on the issue, the entire Opposition was on its feet immediately after the Question Hour, asking for a discussion on a notice moved by BJP member Ravishankar Prasad. But PJ Kurien, who was in the chair, disallowed the request and asked the members to first listen to a suo motu statement by Home Minister Shivraj Patil on the status in Jammu and Kashmir. With the Opposition members not relenting, the chairperson was forced to adjourn the House for 20 minutes. But the commotion continued when the House reconvened at 12.30 pm. It was adjourned again till 2 pm. The final adjournment came within 10 minutes of the post-lunch session with the Opposition members not agreeing to anything less than a statement from the Prime Minister.